Today, the Human Rights Campaign’s Equality Votes PAC announced the launch of a more than half million dollar GOTV digital ad blitz across Florida ahead of Election Day. HRC is spending more than $520,000 on three digital ads aimed at getting millions of "equality voters" -- voters who are willing to make issues of LGBTQ equality a key factor in their vote -- to the polls across Florida. HRC is targeting these voters online with three pieces of creative: an HRC ad titled "Your Voice" as well as two PrioritiesUSA co-branded ads, all of which emphasize the power of every single vote. The ads launched over the weekend and will run across the final 10 days of the election. This is in addition to nearly $50,000 in monetary and in-kind contributions HRC has made to Florida candidates this cycle. Last summer, HRC launched the largest grassroots expansion in the organization’s nearly 40-year history. Since then, HRC has helped more than 30,000 people register to vote across the country, trained nearly 1,600 local advocates nationwide as volunteer leaders and logged more than 20,000 hours volunteering for HRC-endorsed candidates. HRC President Chad Griffin has traveled to more than 30 of the most competitive congressional districts in 18 states, and more than 145 HRC staff are on the ground leading GOTV efforts in 23 states, training hundreds of local organizers and volunteers across the country and educating voters about HRC-endorsed candidates. This cycle, HRC has endorsed a record 478 candidates up and down the ballot. In Florida, HRC joined with Equality Florida and SAVE to endorse Andrew Gillum -- who has been a staunch advocate for Florida’s LGBTQ community -- for governor. Before marriage equality was the law of the land nationwide, Gillum fought to expand domestic partner benefits for city employees as city commissioner in Tallahassee. As governor, Gillum has pledged to install an interagency LGBTQ task force and sign the Competitive Workforce Act — legislation that would extend critically important non-discrimination protections to LGBTQ people across the Sunshine State. In Florida’s Senate race, HRC has also endorsed for re-election Senator Bill Nelson, a cosponsor of the Equality Act, crucial federal legislation that would finally guarantee comprehensive protections for LGBTQ people under our nation's civil rights laws. HRC is also organizing to elect Lauren Baer, who would be Florida’s first openly LGBTQ Member of Congress, to represent Florida’s 18th District. HRC has also endorsed Donna Shalala, Nancy Soderberg, and David Shapiro. 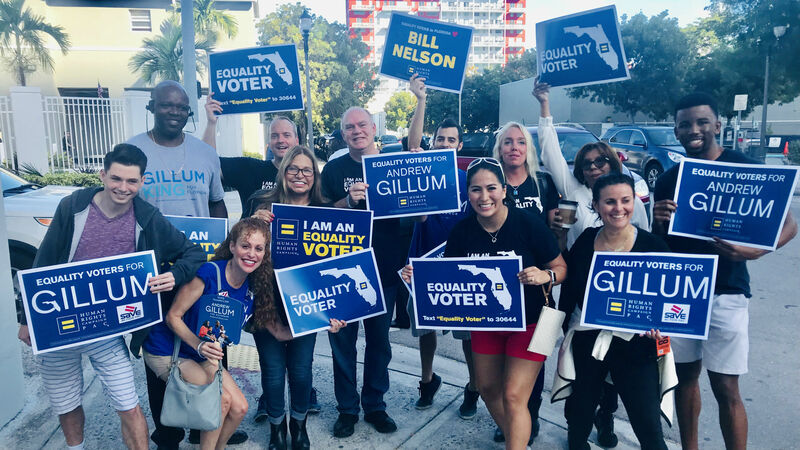 In partnership with Equality Florida, HRC has put staff on the ground to mobilize equality voters across the state through canvassing door-to-door, direct mail and phone banking. In partnership with Equality Florida, Palm Beach County Human Rights Commission and SAVE, HRC has also hosted four Equality Action Academy trainings to give HRC members and supporters the tools they need to take action locally in legislative advocacy and in support of pro-equality candidate campaigns.